An encounter with Dusky Dolphins along the Kaikoura Coast of the South Island, New Zealand. Today required an early start, with our first excursion beginning at 5:30am. By prior arrangement we drove ourselves to the departure point which gave us an extra half hour. The tour departs from South Bay at 6am after check-in in the town of Kaikoura. With the rest of the passengers we are herded onto the vessel while still on land (which sometimes they do if short on time) the boat is then launched by tractor at the slip. We are in search of a pod of Dusky Dolphins which inhabit the coastal waters of the East Coast of the South Island of New Zealand. The Continental Shelf suddenly drops away less than 1 kilometre from the coastline to the abyss of the Kaikoura Canyon, where the ocean stirs up tasty and nutritious morsels for the dolphins to eat. After a short ride we are in downtown Dusky Dolphin territory where we find a frisky pod playing in the deep, cool waters. It seems that as soon as the dolphins have an audience they begin to perform acrobatics and interact with the boat. Those passengers who chose to swim with the dolphins and had already donned their wetsuits launched themselves into the clear water on the skippers signal. On the advice of our tour guide each of the swimmers began singing (with snorkel and mask on) to the dolphins to keep their attention. As a spectator, this was hilarious!! There is a healthy population of Dusky Dolphins in New Zealand of approximately 13,000 to 15,000, and we were fortunate to see some very small baby Dusky Dolphins which when born are only approximately 50cm long. The dusky can swim up to 30km an hour and use their speed and maneuverability to flee from predators such as orcas. As well as dolphins, there is an abundance of sea birds including Albatross, Petrels, Shearwaters, Terns and more. 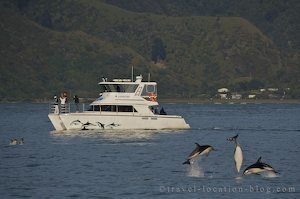 Encounter Kaikoura offer safe and informative tours for watching or swimming with the Dolphins with up to three tours per day. Prior bookings are essential for departures in January and February. Check them out on their website for further information.